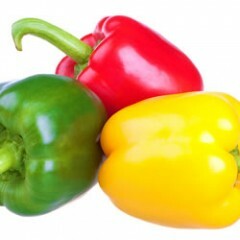 Bell, or sweet, peppers are an important crop on New York fresh market vegetable farms, worth in aggregate close to $10 million according to the most recent data (2011 Vegetable Summary). Hot peppers, such as jalapenos and habaneros, can be important specialty items for direct sales. Peppers are grown in commercial fields with floating row covers, plastic mulch and drip irrigation. For colored peppers early maturing varieties are a good choice for NY growers. Resistance to the soil-borne pathogen Phytothphora capsici is another important attribute. Greenhouse and high tunnel production of peppers is on the rise among CSA, produce auction and market farmers. The Cornell Vegetable Program conducts a number of research projects on peppers such as variety trials and organic fertility.